Cutting The Cord… Is it time to drop cable? We are currently in the midst of a content delivery revolution and the way in which we watch our television and movies is shifting. So what’s next? Cable prices have been on the rise and monthly bills have reached an all time high, forcing a lot of our customers to reevaluate their subscriptions and consider their alternatives. We are often asked if the alternatives would allow them to cut the cord. Most people only have a handful of things they want to watch, but through Comcast they pay for those along with an endless amount of other “noise”. By cutting the cord and streaming content from the variety of platforms available on the market, households can save thousands of dollars a year. The trend has started amongst the millennials and seems to be growing. It is estimated that 9 million households will cut their cable/satellite subscriptions completely by 2016, according to MagnaGlobal. There are two things you must consider: WHAT it is you want to watch and WHEN do you want to watch it. Is it necessary to watch a show at its initial air time? Or, do you prefer to watch on your own schedule? While streaming imposes restrictions when watching live TV, users in good reception areas have the option to purchase an antenna for basic local channels, allowing them access to live local news, sporting events and basic network programming, leaving everything else to be streamed. 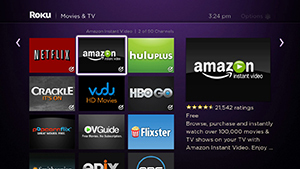 Smart TVs, Blu-Ray players and other devices like Roku and Apple TV all give you access to a whole new world of entertainment, including movies and TV shows. Apps such as VUDU, Netflix, Hulu, Amazon and more provide users with endless possibilities for what to watch and listen to in their home. Amazon Instant Video is also available for streaming on these devices. It offers a variety of movies and TV shows as well as access to premium HBO shows that are not available elsewhere. This can ensure you are only paying for the shows you want to watch. Apple TV offers access to both the iTunes store and Netflix. It includes one of the most extensive collections of digital pay-for shows and movies in the industry and also includes subscription capabilities to watch your favorite sports live on MLB.TV, NHL Game Center and NBA.com. Netflix was originally a content delivery streaming website but has added its own original programs. They created their own critically acclaimed series like Orange is the New Black and House of Cards to create an advantage in this content delivery revolution. One that you may not of heard about yet is Aereo. They are a newer company out of New York that leases remote antennas to subscribers, allowing users to view both live and older streams of over- the-air television on any internet connected devices. For $8 a month they provide full access to the TV signals as well as 20 hours of stored DVR programming. This gives way for a whole new realm of possibilities, although not yet available on the West Coast. They are currently being scrutinized for potential copyright infringements, depending on the outcome, the future of live TV-watching could change the way Americans access their media. No matter what, we are here to ensure your ability to access the content you want from the platform that works for you. We want to make sure our customers are at the forefront, with access to all the content they want, as inexpensively and seamlessly as possible. If your considering making the leap cut the cord, give us a call today so we can review your streaming options and make sure your not missing out on what’s important to you!